Jamaica has begun a high-level investigation into the killing of a policeman shot dead by another officer after allegedly trying to rob a bar. Kemar Beckford, 25, was fatally shot by the off-duty officer after reportedly attempting to rob patrons with a gun. 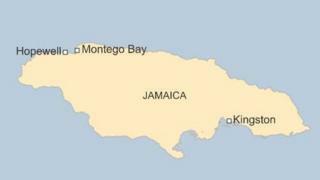 The incident happened early on Saturday morning in Hopewell, a fishing village in north-western Jamaica. The probe is being carried out by the police and the country's Independent Commission of Investigations. Reports say Mr Beckford entered the bar wearing a mask and attempted an armed robbery, before being challenged by the other policeman who was off-duty at the bar. The intervening officer and another patron were injured in the shootout. The police have seized a car they believe had been driven by the constable and left idling outside the bar in a bid to make a quick escape. They also believe the officer had an accomplice who reportedly fled the scene. "Those are the persons who are supposed to serve and protect and they are the ones carrying out these heinous acts," a bystander is quoted as saying by the Jamaica Observer. Hopewell is not far from the popular holiday resort of Montego Bay.